THE MILLY SOO BAND on Music Stage at ? For lovers of the Great American Songbook and those who would like to explore the lesser known hits of yesteryear. Their Jazz singer Mary specialises in classic jazz and vintage sounds from the 30s to today's standards and covers. Influences include Julie London, Peggy Lee, Frank Sinatra, Doris Day, Sarah Vaughn and of course Ella and Billie. Most describe Mary as possessing a smooth velvety voice - relaxing and soothing. Together Mary and John make a good combination as guitarist John sports a unique talent and variety of styles and with his expertise complemented by Win on double bass "this girl makes her bass sing" and Sandor on drums; the engine of the band, creates a varied and lively groove. TRACKBAX on Music Stage at ? 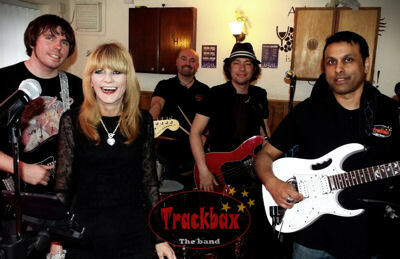 We are a five piece band, playing both pubs and clubs. For pubs we play a rockier set but also do a more traditional club set. Or a mixture of both. Your choice. DAMO AND THE DYNAMITES on Music Stage at ? Damo And The Dynamites are a classic, old-school Rockabilly three-piece, with plenty of original Rock'n'Roll from the Fifties and, when the mood takes us, lots of early Elvis too. Jivetastic! We are based in Harrow so we're local to the Autoshow; we played there last year and we're delighted to be invited back. We take social media seriously and will happily collaborate with venues and promoters in spreading the news across platforms. We video all our gigs, and the best footage makes it onto YouTube (by permission, where appropriate). Follow us and tag us! BIG AZZA & THE JUKESTERS on Music Stage at ? Big Azza & The Jukesters are a group of top quality musicians, born from great friendships, musical magic and mutual respect. A Harmonica led 4 / 5 piece band playing R&B, Jump Jive, Swing & Blues just how they should be played. Top quality music for any event.